In the eight years of the Park City P2P — perhaps the best true singletrack long distance mountain bike race in the country — there have been three men who have been on the top step of the Pro/Open podium. Young local Keegan Swenson won last year. The year before that it was Utah's Rob Squire. Before that, it was all Alex Grant. Grant won in 2014, 2013, 2012, 2011, 2010 and the race's inaugural year, 2009. Six straight. He skipped the 2015 P2P to race the mountain bike World Championships, in Andorra, and in 2016 he was recovering from a shattered heel. This year had the prospect of all three of the winners lining up together. But it is Swenson's turn to skip the P2P for MTB Worlds. When the racers roll out in Park City on Labor Day weekend, Swensen may be in Australia. Selective-vision.com (find your photos online). Fret not, there will still be plenty of firepower. In addition to Grant and Squire, Geoff Kabush and Todd Wells will line up in Round Valley on the morning of Saturday, September 2, awaiting the Fruit Loop cannon that signals the start. Wells, from Durango, Colorado, is a three time Olympian and 15 time national champion in XC, STXC, Marathon and cyclocross. Wells has also won the Leadville 100 three times. Kabush, from British Columbia, Canada, is a three time Canadian Olympian and 10 time Canadian national champion. Wells was in Utah earlier this summer, racing his first Crusher in the Tushar, where he finished in second place, dropped by Squire on the final climb. Wells has also raced mountain bikes several times in Utah during various USA Cycling national tour events that were an annual Deer Valley summertime staple. 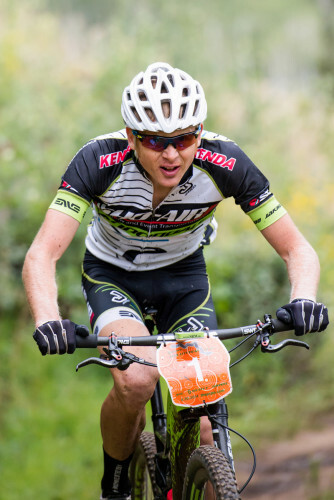 Kabush has also raced those Deer Valley Pro XCT events, and has pedaled many of the trails used for the P2P in industry events run by his current bike sponsor, Scott. This summer has seen Kabush on the podium at gravel events, Enduros, XC races and road races. Last month Kabush won the seven-day offroad BC Bike Race. Even for experienced P2P riders, the course will offer something new this year. The finish has been moved to Kimball Junction, near the base of the Utah Olympic Park and its iconic ski jumps and bobsled track. Skullcandy will show off its new Kimball Junction home by hosting the finish line party. On the women's side, the picture is a bit less clear. As of now, the only returning women's winner registered is Evelyn Dong. But Marlee Dixon, who has finished second, second, second and third the past four years, will be back. Amanda Carey, Evelyn Dong and Gretchen Reeves have all won the P2P twice. Other riders to watch include Larissa Conners, Ami Stuart, and Emma Maaranen. The P2P is that rare long MTB race made up of trails you actually want to ride all day long. It is pretty much a link of some of the finest singletrack in Park City, for about 80 miles. It sells out right away, with a race field capped at 380. For riders hoping to get in still, there are always last-minute opportunities. There is a simple buy/sell community found under The Race tab on the P2P website, ThePCPP.com. The website gives you the race route, as well. It is pretty cool to be in the woods on your bike watching top racers powering up a climb after more than four or five hours of race pace riding. Choose your route wisely and you can have a great ride that intersects but does not overlap with the race route. Want to go the other way, and avoid the racers all day? The website also has suggestions for that. Check out the Trail Impacts button. Roughly, for the morning you can avoid the race by pedaling in the Canyons area and in the afternoon riding Deer Valley or Round Valley. The P2P has become a Park City institution, and gives back to several community organizations. The opportunity drawing to benefit the Park City High School MTB team has become a check-in tradition, with eager high school racers offering drawing tickets. Even if you are not 80 offroad miles strong, you can play an essential role in the P2P. Volunteers are always needed. Volunteer info can be found under The Race tab on the website, ThePCPP.com.